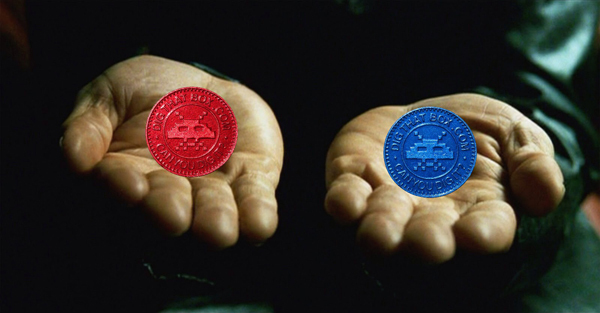 2015 marked the sixth incredible year for our collectible arcade token giveaway. Each year we select 500 lucky winners to receive a set of our highly prized custom arcade tokens. We also picked 25 people at random to receive special video game bonus prizes. The coins and prizes are mailed to our fans across the country and around the globe. The process is an incredible amount of work and it's all accomplished by one man. Here's a review of our 2015 giveaway, and a sneak peak of what you can expect in 2016. As always our contest began on June 1st, 2015. This was the final day of our yearly arcade token countdown. In keeping with tradition our new tokens were revealed in our yearly arcade token image gallery countdown. Every year we create a new art gallery filled with cool and unique collectible arcade tokens. The countdown actually starts on April 1st every year. Each day we post a new classic arcade token. The countdown lasts 60 days and on the final day we reveal our new coins. This year we also wanted to reward our most loyal fans with a special bonus. Every week we posted a new "secret word" in our arcade token gallery. The word was posted on a Friday and deleted by Monday. There were seven secret words in total. If you collected all seven secret words you received SEVEN additional entries into our contest! For many gamers the E3 Expo is the most fun and exciting event of the calendar year. I have been lucky enough to attend every E3 Expo since 1999. One of the things I enjoy the most is collecting swag and promo items from the various companies at the show. That's the reason why I created our very first collectible arcade token. I wanted to give something back to the show that has given me so many wonderful memories over the years. I also wanted to create something for people who are unable to attend the show. It's my way of spreading the fun and excitement of E3 to everyone! Now here's a little bit of interesting trivia about our coin. The E3 Expo is actually the Electronic Entertainment Expo, or just E3 for short. However, it is unofficially called the "E3 Expo" even though the "expo" part is unnecessary as it is already part of the E3 title. 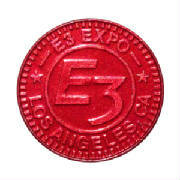 The show is often referred to as the E3 Expo to avoid confusion with other brands using E3 in their title. For example there is an E3 Ranch in Fort Scott, Kansas. So this is why E3 is often called the E3 Expo. Even on the official Facebook page the show uses this title. Originally I planned to date the coins. However I thought it would be fun to pay honor to this great unspoken tradition. It's something that only veterans of the show know about, and now, so do you. 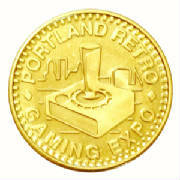 This year I also created a special coin just for the Portland Retro Gaming Expo. It was limited to just 1000 units. This golden coin will be the first in a trilogy of coins to be released over the next two years. The only way you could get this coin was to attend the show. However, some coins were put aside for our loyal fans. 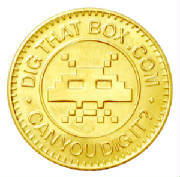 They could get this coin if they sent us a photo of their Dig That Box arcade token collection. They were required to have at least five previous coins in their collection. I was overwhelmed by the response. I honestly did not realize how many people had been following this contest from the beginning. It truly made me happy to see so many dedicated coin collectors responding to our latest giveaway. Your loyalty humbles me. The new Arcade Token Collector's Club was limited to just 100 members. Spots in the club filled up very quickly. What you see above is just a sample of the images we received from fans wanting to join the club. As a member of the club you are guaranteed to receive all coins released in the following year. Your membership lasts for one year and must be renewed each year by sending us a photo. This guarantees that you will not miss out on any future tokens, including new coins that may not be available through our normal mail away promotion. Club members are automatically entered into our yearly contest giveaways and are still eligible to receive other prizes. In the case of "secret word" events they are still required to collect any secret words and send them in to our usual contest mailing address. The mailing process is an incredibly grueling and time consuming task. It literally takes several weeks to accomplish and most of the hard work is done by just one person, yours truly, the author of this article. This giveaway has become so popular that our mail server always crashes during the first couple of days. Once things slow down I finally begin the process of picking the winners. Each year I start by verifying the mailing addresses. This is no small task I can assure you. I often see people return from previous years. I can't tell you how happy it makes me feel to see so many familiar names writing in for a coin. After the addresses are verified I hand pick every single coin. That's right, I hand pick every coin that goes out in the mailing. I want everyone to get the best coin possible. This year I actually recruited help for the mailing from a local school. However, even with a small hardworking group of students the mailing was still overwhelming. The process of stuffing the envelopes and making trips to the post office took several weeks. I am happy to announce that in 2016 I have streamlined the mailing process. Coins will now be delivered right after the E3 Expo in June 2016. Any additional club coins will be mailed separately later in the year. The first 500 people to respond to our promotion received both of our new collectible arcade tokens. This year, we mailed tokens to 500 people around the world. In total, we have distributed roughly 18,000 arcade tokens worldwide since 2010. We have created twelve different tokens over a period of six years. Ever since we started this promotion in 2010 we have been able to mail tokens to every state in the country. That's an incredible accomplishment and it's something that makes me very happy. This year California lead the way with the highest number of entries. Washington came in second, with Texas coming in third. These states were followed closely by New York, Illinois, Nevada and Florida. Since the start of this promotion in 2010 we have shipped tokens to over 45 different countries around the globe! We shipped tokens to the following nations: Austria, Australia, Argentina, Belgium, Brazil, Canada, Chile, China, Columbia, Egypt, El Salvador, England, France, Germany, Greece, Iceland, Iran, Ireland, India, Italy, Japan, Kazakhstan, Korea, Lithuania, Mexico, Netherlands, New Zealand, Norway, Philippines, Poland, Portugal, Puerto Rico, Romania, Russia, Saudi Arabia, Scotland, Serbia, Sweden, Singapore, Spain, Taiwan, Thailand, Turkey, Trinidad/Tobago and the United Arab Emirates. GRAND PRIZE: Sony PlayStation TV & One Game: Kim L. of San Francisco, CA was the winner of the first fantastic grand prize. She won a brand new Sony PlayStation TV deluxe bundle which included a controller, memory card, and the LEGO Movie Game. She also chose Persona 4 Golden as her bonus game. Congratulations Kim! GRAND PRIZE 2: Nintendo Splatoon Inklings Amiibo Set: David L. of Ft. Worth, TX won our second grand prize, a Splatoon Inklings Amiibo set. We also included a special Splatoon squirt gun (not pictured) as a bonus prize. Congratulatios David! The Danger Prizes were prizes we considered so bad that no one would want to win them. Two of these prizes were actually refused by their winners, who never wrote us back to confirm their mailing address! I was happy that these three unlucky folks got the joke and all of them were pleased to receive their danger prizes. 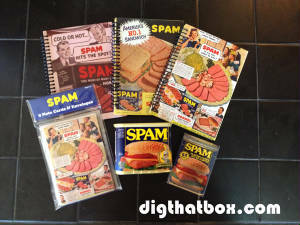 The Spam Prize Winner: Our Spam Prize was claimed by Carlos L. from Pomona, CA. Our friend Carlos was delighted to receive the Spam Prize. He informed us that he actually grew up eating the tasty canned meat product when he was on camping trips with his dad. As always the Spam Prize included Spam branded memorabilia and an actual can of Spam! Delicious! We would sincerely like to thank everyone who helped us promote this event. 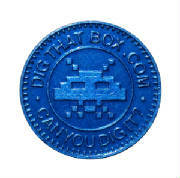 Special thanks to our friends at AtariAge.com, CheapAssGamer.com, The E3 Expo, Comic-Con International, Rick Weis and the Portland Retro Gaming Expo, Kevin Troklas at Tokens Direct, and most importantly everyone who wrote in for a token. We would also like to thank John Hardie and our friends at the Video Game History Museum.